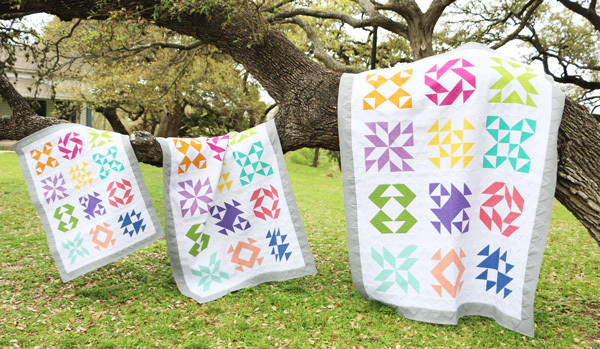 Can you believe that it has been a whole year of quilty, surprise fun delivered right to your door with the Sew Sampler Subscription Box?! We have had SEW many fun items in the last 12 boxes, including the Series 1 Recipe Cards to complete this eye-catching quilt with the exclusive Sew Sampler Fat Quarter Bundle! To celebrate our one-year anniversary and to kick off the Sew Sampler Series 2, we've put together a few of our favorite items from the past 12 boxes into one jumbo box to giveaway to one lucky winner! That's 12 items + a pattern!, valued at MORE THAN $150! So, if you're a current Sew Sampler subscriber and have been wanting a duplicate of an item for yourself or to giveaway to friends, be sure to enter! If you haven't subscribed to the Sew Sampler yet, enter now to get a taste at the value and fun that these little blue boxes hold!